It can add a live chat room to Oxwall. And the best part is that a free hosted chat will be assigned to your Oxwall, once the module is successfully installed. 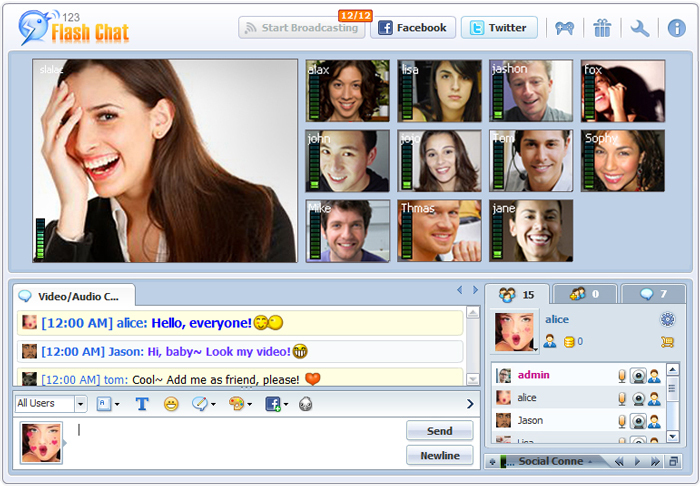 It adds a chat room with multiple skins and users single sign-on. Recent changes: The module has been updated to be compatible with the latest version of Oxwall. PPM/PPV mode has been introduced as an optional video mode and HTML chat client is enabled. Firstly a chat button will be added to the top menu of Oxwall. Install the module, and the Oxwall user database will be immigrated to the chat room and single sign-on will be enabled. It's all automatic! Then Oxwall users may click the "Chat" button directly, without being asked to login again. The following data of the chat room can be displayed on the Oxwall index page to attract more users to join chatting(The 3 types of data can be individually disabled to display as you prefer). Chat users can add linking to their Facebook, Twitter, Yahoo or Google account, so to update their status on the social networks with their activities in chat! For paid customers, video conference mode can be enabled. Multiple video windows will automatically display at top if a chat room is on the video conference mode, with the video publishers become broadcasters and the rest become viewers by default. Click one video window to enlarge it and shrink the rest of them. The Video Conference Module is especially ideal for virtual conference, webinar, chat community, social network, etc. 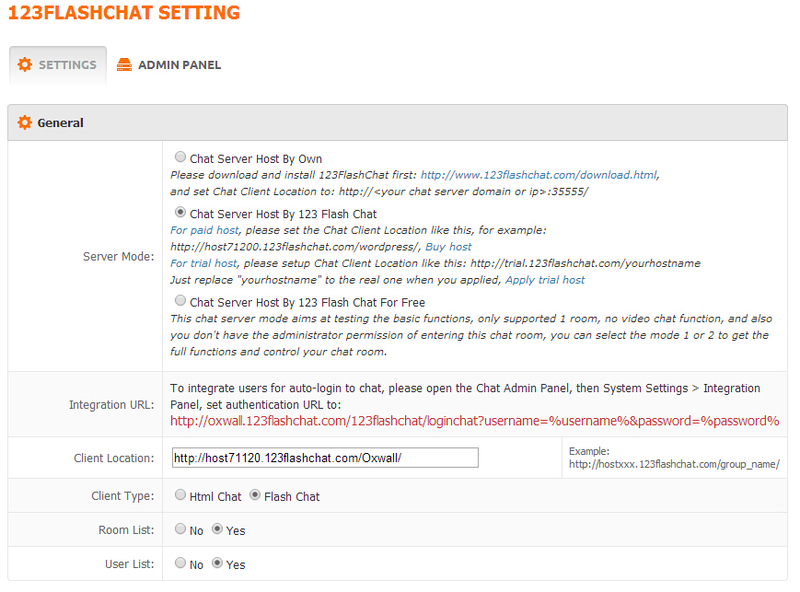 Admin--Manage Plugins--123 Flash Chat--Settings, then you will able to configure the chat into your chat. There is a new mobile App available now for 123 Flash Chat users; It is accessible for iPhone, iPad and Android devices users. Click here to get more info. Except the Oxwall ACP, the chat admin panel is also imported here for your convenience. Please be aware that the admin account here might be different to that of the Oxwall ACP. Users integrated: Users of your Oxwall can be fully integrated to chat room. Single sign-on: No separate login is required. Profile integrated: Oxwall user profiles can be fully integrated to chat room. New! Avatar integrated: Oxwall users avatars can be transferred as well. New! Multiple skins: Sixteen skins are available to fit in your CMS. Various chat clients: A standard Flash client has full features, and an enhanced HTML 5 chat client has vivid appearance, loads fast and works cross devices on pc, iPhone, iPad and Android devices. Customize size and interface language to match your CMS. Admin Panel: A chat admin panel is available for paid user to customize the chat room. Display chat data: chat room list, online users, chat user names, etc. can be displayed or not. Admin Clearing Screen for All users. New! Social connect features : social sign-on, linking, sharing, Facebook chat, tweet chat and follow a Twitter user. New! 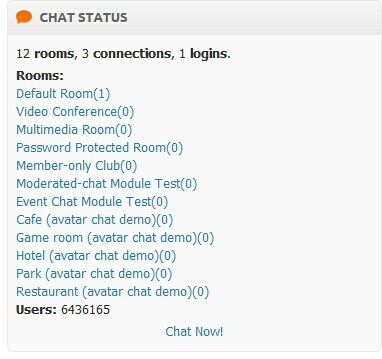 Luxurious chat features : Lobby and private chat, Avatar, smileys, flash emotions, post-notifier, etc. Free Video Support for paid users. 30 Days Free Video Support for new text chat buyers. New! Hand-raising Feature is enabled. New! Powerful Administration for paid users. PPM/PPV support for paid users. Make profit by running the chat. New! Virtual Gift available, vivid and amazing. Mobile APP available; Iphone, Ipad and Android devices supported. New! Professional support staff for paid chat hosting user or license buyer. 123 Flash Chat provides three options for webmaster, free trial license, free hosting or paid ones. Click here to get more details for free chats. Oxwall is unbelievably flexible and easy to use PHP/MySQL social networking software platform. Its flexibility is an extremely easy way to change the way it works using Oxwall plugins. These plugins are complete units of functionality that can be used for various purposes. We take special care about core and plugins compatibility so any updates are easy like a breeze. Just click that button in the admin area. Oxwall offers unseen level of efficiency when you need a full-featured, working site. The project is operated by Oxwall Foundation - a non-profit that oversees the platform development and coordinates third party efforts. Oxwall has been around since 2010 and never stopped active development. Join the movement!